Open front design for full view of displayed literature. 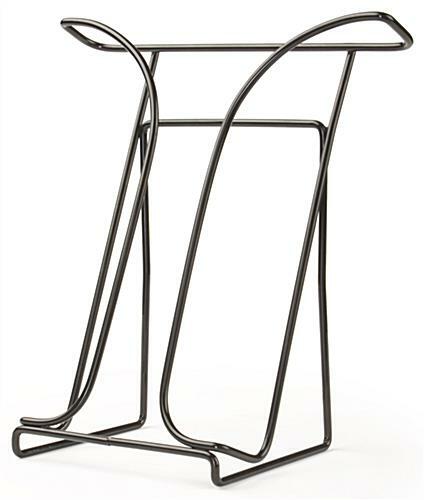 Black, powder-coated wire construction for durability. Single pocket is designed to accommodate 8-1/2" x 11" magazines. 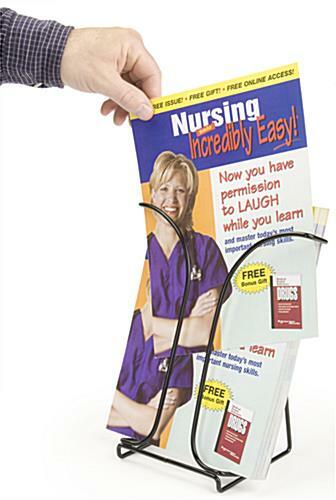 These literature holders are designed to accommodate monthly magazines, catalogs or stacks of flyers and pamphlets. Each unit measures 1-3/8" deep and can hold a stack of standard, 8-1/2" x 11" magazines. These literature holders are constructed from durable wire and feature a powder-coated black finish to easily blend in with any office décor or business setting. Each unit offers a full-view of the front of each displayed publication. This enables patrons to clearly see the magazine being presented within the literature holders, and take or purchase one to continue reading. 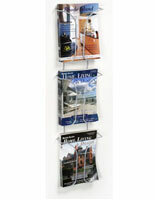 These metal brochure pockets are designed for use on countertops, as they feature a compact design. 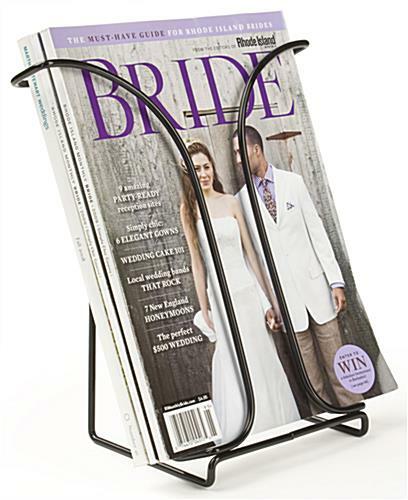 These magazine racks, literature holders are generally used within doctor's office and waiting areas to present periodical health publications. 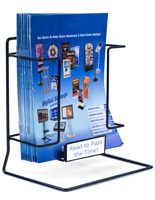 These metal brochure displays can also be found in salons, displaying promotional flyers. 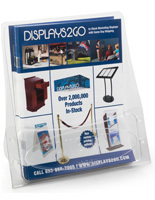 These literature holders can also be used to display product catalogs during trade show events. 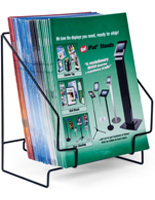 Retailers often use these displays to showcase monthly circulars in their stores as well. 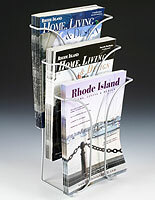 These catalog displays are available in silver finish, in addition to the black finish seen here. Each magazine rack is sold at an affordable price. 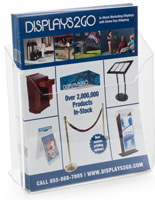 Purchase this countertop display in bulk for more savings. 9.4" x 14.5" x 4.9"
10.3" x 9.8" x 1.4"
We are always looking for racks for our Arizona's White Mountains Magazine, a publication about everything to do and see in north eastern Arizona's White Mountains. I really like the heavy steal this is made from. Nice design, except I would have brought the top down a bit. It appears to fight with most Magazines titles it would display. They could have achieved the same function and look and featured the "Magazine" better. After all is is the Magazine we are trying to sell. It holds 5 Magazines of our size, nicely and sits well on counter-top. Price was reasonable. Hi Brenda, Thanks for your thoughtful feedback and sharing this photo with us! We value customer input and always love to see how our products are being used. We hope you shop with us again soon! A much sturdier and well-made piece compared to what we have used in the past. 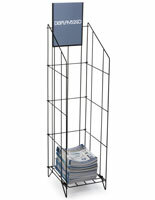 Quite often we use racks to display flyers at workshops and we have to ship the product back and forth. This piece's construction should ensure that it can be shipped without much fear of breakage. We may come back to buy more in smaller sizes for tri-folds. Great item for its price point!